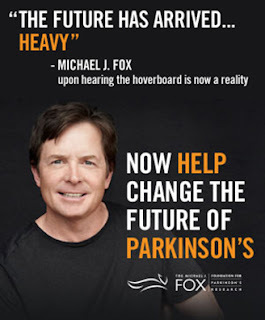 Well, if you missed the deadline for ordering your hoverboard, you will have to wait until the Fall to get a chance to order one...at possibly a higher price, and no mini hoverboard. Hey, you had 20 days to do it...and it was extended another 7 days. A full month. No excuses. Bet you wish you had a time machine right about now. This is the part where I go off into a tangent. People keep saying that "hover technology will not be invented until 2015". First of all, the idea of hovering is pretty much impossible without some sort of track system. There is nothing to repel or push off of. There is no way of cornering or steering something that hovers...unless the entire town is paved with some sort of mag-lev tech...translation, pretty much impossible. The laws of physics simply does not allow this idea to happen. Yes, we have all seen the viral videos of people making floating boards. But, all they do is float in one space, it cannot stray away from the specific magnetic field. There are trains and roller coasters that float on magnetic tracks, this is the only way to directionally control hovering technology. Ugh, what about the weight of the rider? A kids' ride-on usually has a weight limit, when you factor in various weigh on a floating object, there will be problems with keeping a board floating at about four inches off the ground. Physics, people...think about it. Second, why to people keep stating the 2015 date? If the technology was invented in 2015, it would take years, perhaps decades before it would be implemented into a toy or product for kids. Logically speaking, the hover technology would have to be invented sometime around 2010 or so. Also, not every kid would have the latest toys. I have a PS3, it is about five years old. I drive a car that is over 30 years old. Point is, almost everything I own was not invented/made/purchased this year. What if the kids hovering in the movie had the hoverboard since Christmas of 2014? So, are we to believe that everyone in town has got this hovering technology? Okay, what about Griff and his Pit Bull? Everyone knows that hoverboards do not work on water, this is why you need rocket power, like the Pit Bull. So hovering is invented in 2015...and immediately there is a board out there with rockets? No! In a logical timeline, hovering technology would be invented in, say 2015...a few years later, it gets cheap enough to put into everyday product. This is where you have boards for 'professionals' and maybe some for folks with a lot of money. Give it a few more months, and the technology should hit the public market. Griff's gang would not get their recreational hoverboards until about 2021. At around the same time, the idea of putting rockets to aid in water use could start. This means that around 2023 Griff can get his Pit Bull. Somewhere in between the time that recreational and rocket boards are being made for the public, kids' versions would hit the market. Perhaps in the distant future this technology will exist. By that time, I am sure time travel will be available as well. Anyways, if you wanted one, I hope you got your order in. Not keeping my hopes too high, but maybe I can meet Michael J. Fox, one day. In other hoverbaord news, you have until Tuesday to pre-order your Hoverboards over at MattyCollector.com. Boards will ship in the fall. There is a chance that there will be some boards for sale during the fall, but prices may be higher and will not include the mini board that comes with pre-orders. Also, boards may sell out, so pre-ordering is a good idea...if you want one. Get an EXCLUSIVE Hoverboard Scaled to 6" Action Figures When You Pre-Order! Pre-orders are accepted from March 1, 2012, through March 20, 2012 only at MattyCollector.com, with an expected shipping date of November/December 2012. Pre-order during the 3/1-3/20 period and not only will you be guaranteed to get an authentic Hoverboard prop replica, you'll receive a pre-order exclusive, too… a Hoverboard scaled for 6" action figures! It'll hold most Mattel 6" figures, so your favorites can get in on the futuristic fun, too. The only way to get this totally rad lil' ride? Pre-order during the 3/1-3/20 period! Here are some more images of Bob Gale, Michael Lantieri and Mary Anne Lantieri from our meeting last week. These are rare Japanese movie programs. The Japanese go all out when there is a movie release. They make these programs to hand out to movie goers to give them a little information on the movie. Bob Gale personalized each one. Back to the Future - "Have a wonderful FUTURE->!" Back to the Future Part II - "Best wishes for the FUTURE->!" Back to the Future Part III - "May your FUTURE-> always be bright!" I like that he puts a little arrow in FUTURE, like the logo. Nice touch. I got this at one of the Open House events at DMC-California. Another rare item, this one is truly one-of-a-kind. Personalized with "GREAT SCOTT!" This was the highlight at San Diego Comic Con last year...at least for Back to the Future fans. Sold out within the hour. Luckily, as the designer of the car, I have a few. This one means a lot to me. It is as if, Bob 'signed off' on it with his approval. We had a few lying around, and me sure he went home with a couple of these. Another one personalized with "GREAT SCOTT!" "GREAT SCOTT!" This was made by Sal Celeste. Designed to replace the cubby hole door behind the driver. It looks too good to hide behind the seat, and I am too lazy to mount the hardware. If you have a DeLorean and you have a chance to get you hands on one of these, do not hesitate, it is worth it. Quality piece of work, Sal. Yes, that is a figure of Troy McClure that I have, always sitting in my car. 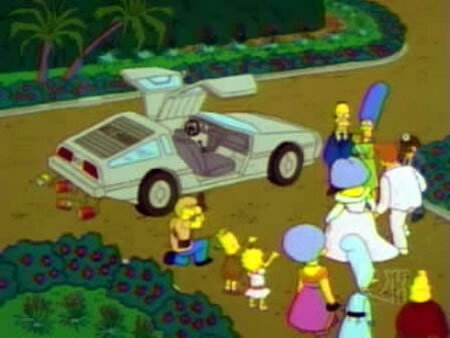 Troy McClure, of course, owns a DeLorean, as seen in Season 7, Episode 19 of The Simpsons. 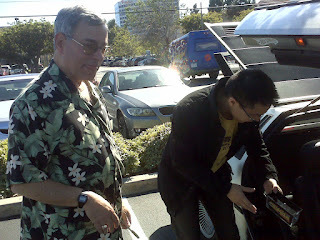 Having Bob Gale sign your DeLorean, and writing "Drive at 88! "...achievement unlocked! Ah, the famous Hoverboard Chase scene in Back to the Future Part II. Well, it took a while, but Mattel is making the famous hoverboard that Marty McFly used to hover around Hill Valley in 2015. You can pre-order yours at MattyCollector.com, until 20 March. 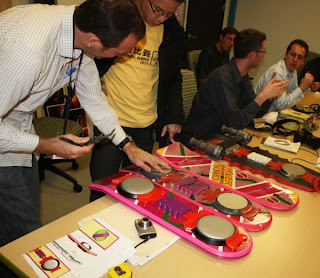 Mattel showed a prototype of the board at New York Toy Fair last month. Since then there has been lost of buzz. This is a unique situation where everyone knows what we are doing. Most of the time, the industry is very secretive regarding projects in progress. The hoverboard is essentially 'out', everyone has seen it, and there are countless replica prop builders out there that have made their own boards. I am proud to be a part of the team that is making this happen. I serve as 'technical adviser' on the project. There is a huge team of about ten people on this one project including design, engineering, electronics, sound design, package design, legal, licensing, marketing, etc. On 8 March, we had a meeting with Back to the Future Writer/Producer Bob Gale, Special Effects Supervisor Michael Lantieri, and assistant to Mr. Gale Mary Anne Lantieri (also Michael's wife). I spent the better part of the day hanging out them. The meeting was documented by Beyond the Marquee, and there will be a video of it soon, possibly next week. You can see more pictures from the meeting at the MattyCollector Facebook page. Unfortunately, I have the skill of sitting in places where I am either not in facing the camera, or totally out of focus. I assure I was there. Here are some pictures I took during Bob Gale's visit to Mattel. This is one of the many screen used boards, made of foam. Proof that I was in that meeting with Bob, Michael, and Mary Anne. And, I got to touch the boards. Michael Lantieri and Bob Gale sharing stories from the Back to the Future trilogy. On the table, you can see the Pit Bull and a plywood version of Marty's board. Wood was used for strength and durability, this was a 'stunt' board that Michael J. Fox and his stuntman Charlie Croughwell. On the table, a little piece of the Pit Bull, Mattel's Toy Fair prototype, screen used wood board, screen used foam board. You can see wired feet holding up the foam board creating the 'floating' effect. In front of Bob, you can see my San Diego Comic Con Exclusive Back to the Future Time Machine box. Yeah, that is pretty awesome. Along with sharing fun stories of production, Bob showed us original concept art for the hoverboards that were hand drawn by John Bell. He also read some fan mail that we kept for over twenty years. Kid would write to Universal (and Mattel) about the hoverboards, usually asking for where to get one or just straight up asking them to send them a hoverboard. Each letter was answered by Bob and Mary Anne, some were sent pictures of hoverboards. One kid got a Pit Bull key chain. ﻿﻿﻿﻿﻿﻿﻿ After our question and answer session, Bob signed a bunch of stuff for everyone. Lots of DVD's and Hot Wheels Time Machines...yeah, you know it. I waited until later to get my stuff signed. We also gave Bob, Michael, and Mary Anne a tour of Mattel's 'top secret' Design Center. Not really top secret, everyone knows where it is, but not everyone gets to go inside. I showed them my messy cubical. Bob Gale was in my cubical, that makes it a historical landmark! Bob noticed that I had a box of DeLorean sign sheets, I gave them a small stack and they had me sign it. I personalized Bob's with, "You other friend in time." Here I am waiting to get my stuff signed and Bob, Michael, and Mary Anne asked me to sign something for them. Once the tour was over I walked them outside to my car. 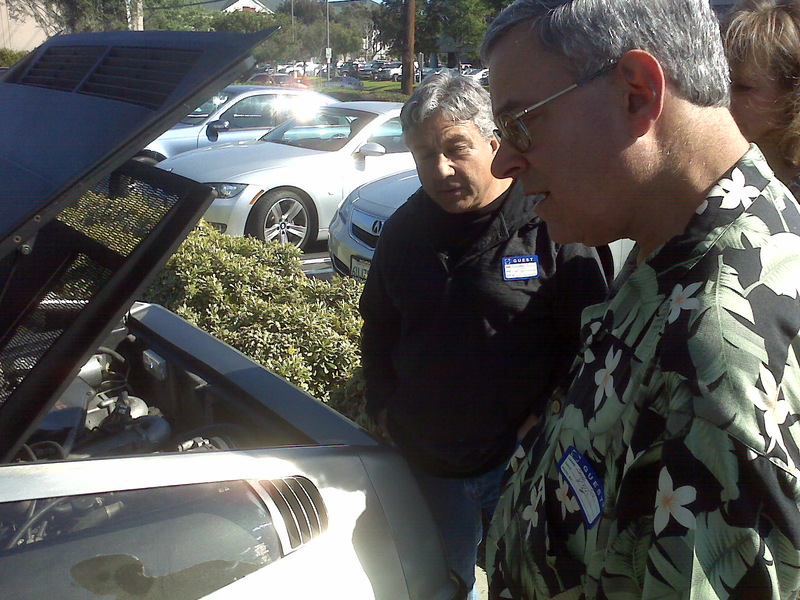 Bob Gale is one of the reasons that I have a DeLorean. I asked Bob to sign a bunch of stuff. Of course, I had the good stuff. Bob was shocked that I had all three Back to the Future Japanese movie programs, he signed all three. I had him sign a hand painted cell from the animated series. I had a few more things signed by Bob, I will post pictures of these later. One last thing I wanted Bob to sign, my car. This is all sorts of awesomeness! He personalized it "Drive at 88!" How cool is that? Needless to say that it was an unforgettable day for me. Today, I was at McDonald's to get a Shamrock Shake. Well, I did not get one but I got something new off the menu. I have had the idea of a Filet-O-Fish Happy Meal for years, no decades. It was not a Happy Meal but a change involving my favourite McDonald's sandwich. They doubled up on their Filet-O-Fish sandwich, making it a 'Double Filet-O-Fish'. Twice the fish and twice the cheese. Not bad, but I am used to the fish to bun ratio of the original. Guess I will have to go back and get another one over the weekend when I pick up a Shamrock Shake.